I watched the movie Blackfish on CNN the other night, and my eyes filled with tears as I watched the story of the Orca or killer whales in captivity and in the wild. Orcas are the largest animal in the dolphin family. They swim freely in the cold coastal waters from the polar regions to the equator, feeding upon seals, seabirds, and sometimes other whales. They live in social groups, and study of their brains reveals highly evolved emotional states. They swim free with their pod families–sometimes in groups as large as forty. Even though their bodies can be as long as thirty-two feet and weigh up to six tons, they swim gracefully through the water, only showing the black of their dorsal fins when they surface. No cages hold them; no trainers try to control them; no screaming kids and cheering parents disturb their world. If you missed watching Blackfish on CNN, you missed an emotional look at the treatment of killer whales in sea parks around the world. It also looks at what happens when the captive animals act out their natural instincts while in an unnatural environment. Someone on film compared it to humans having to live in their bathtub for the rest of their lives. Wouldn’t that drive most of us insane? As a result, these captive whales have maimed and killed their trainers too many times over the years. Those who feel the movie is too one-sided against the sea parks shout about the purpose of zoos, aquariums, amusement parks, and other places holding wild animals in captive environments far different from the natural world. The purpose is to give kids the chance to see these animals up close and personal to learn something about wild animals they might otherwise never see. 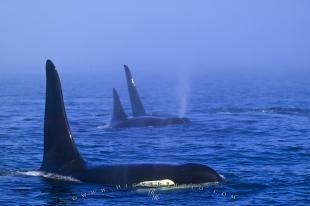 The killer whales stay with their offspring and swim through the ocean in groups. Females give birth every five years or so, after a seventeen-month pregnancy, and they are highly protective of their offspring. In captivity, many times the offspring are taken away to be the star attraction at yet another amusement park far away. The abandoned mothers scream in despair when their offspring leave. In captivity, they are frustrated and lonely. When this happens, anyone or anything in their wake may want to get away as fast as possible. Except in these prisons, there is no where to escape. In the wild, the killer whale’s life span can equal that of a human. However, in captivity the life span is shortened by as much as one-half to two-thirds as long. There is nothing humane about their captivity. Wild animals are wild animals. Maybe we aren’t supposed to be able to watch them up close in these controlled environments. What are we learning about Orca whales when they are performing surrounded by cement walls? Not a whole lot, I can assure you. Some folks argue that showing a younger generation the performing black and white giants, they will care about them and help to conserve them. I’m not sure about the validity of that argument. When I grew up, we didn’t have these sea parks. I never saw a killer whale yet somehow I’ve managed to care about wildlife and their treatment. Confining them in a pool isn’t how we learn about wildlife. Sometimes we can help wildlife by keeping them in captivity if they are injured, but the wildlife folks I’ve known make every attempt not to humanize wildlife, so once rehabbed, they can go back where they belong. Watch the movie and draw your own conclusions. 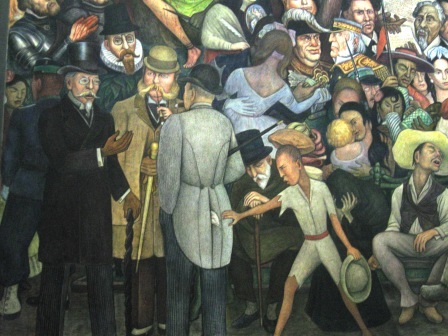 Our first full day, Sunday, in Mexico City brought us to the Alameda Central seeking a late lunch and the Museo Mural Diego Rivera. We found both with unexpected pleasures. It took us a little while to find a restaurant serving authentic Mexican food. We passed three Burger Kings, two KFCs, a Pizza Hut, and a Krispy Kreme as we walked down the sidewalks lining the Alameda Central. Finally, we spied something that looking interesting. La Trainera beckoned us into its open doors where Jimena Garcia greeted us. “Are you open for lunch?” I asked. She brought out a large platter of seafood from which to pick our lunch selection. “I’m sorry I don’t have a menu in English,” she said in impeccable English. We chose the red snapper, plus lots of other suggestions by Jimena. The staff spoiled us for eating anywhere else. The minute my glass of Perrier came close to empty, a waiter materialized to fill my glass. We ate the best cerviche so far on our young trip (and still the best we ate while in Mexico). It was stocked full of shrimp, octopus, and a white fish–all cooked. They began bringing dishes of black beans, rice, corn tortillas, guacamole, salsas, moles, and chips. Then the beautiful red snapper broiled with mild crushed red chiles spread on the fish appeared. The best fish I’ve ever had in a restaurant. 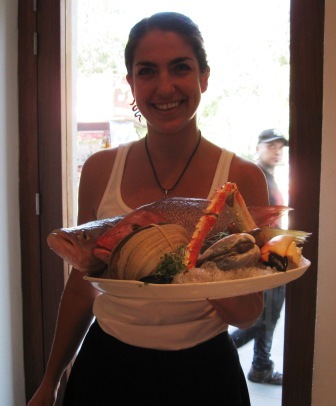 Jimena told us the restaurant began as a seafood market and expanded to a restaurant. We’re very grateful it did. The meal we ate there ranks as the best meal ever. 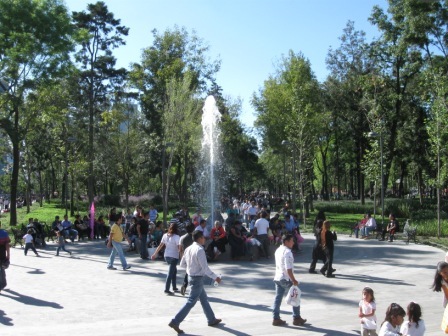 We then began our journey through the park of the Alameda Central, which takes its name from alamos or poplar trees, planted there in the Sixteenth Century. The many fountains are interspersed with trees and lavender bushes in full bloom. The park is a gathering place for families on Sunday afternoons. 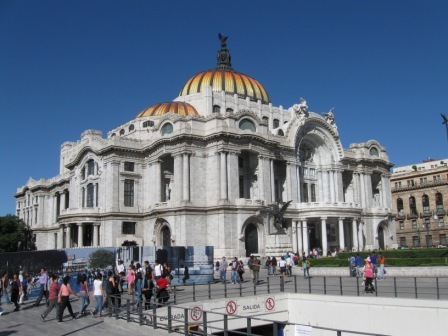 Many of the museums offer free admission so folks can get into see some of the best art of Mexico. 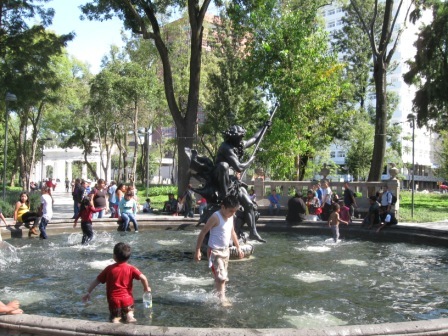 There are several fountains where children and some adults splashed while other family members looked on. I’m impressed. Here we were in one of the biggest cities in the world, and yet folks have found their community in the middle of it. 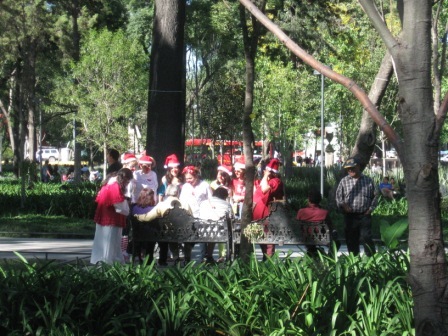 We’re not sure why, but many folks were wearing red plastic noses and Santa Claus hats. No matter to us why it was happening; it was wonderful to see such abandon by adults, teenagers, and youngsters alike. I’m not sure we have anything like it in the United States. 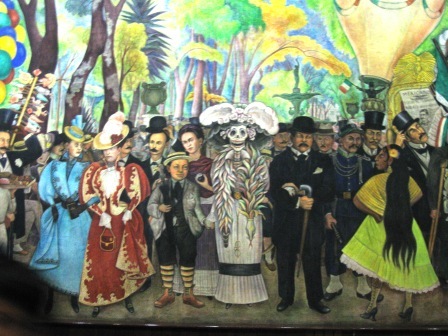 We continued our journey to the Museo Mural Diego Rivera where Mexico’s favorite artist painted and lived. The museum displays his Dream of a Sunday Afternoon in the Alameda Central. 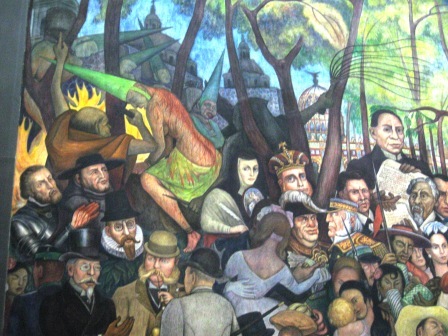 The mural shows the history of Mexico along with the dreams and recollections of Diego Rivera. It includes two-self portraits and a portrait of his wife and fellow painter, Frida Kahlo. As we gazed at the long mural, musicians began setting up in front of it. Eventually, they began a program of music with a flutist, pianist, and two operatic vocalists. 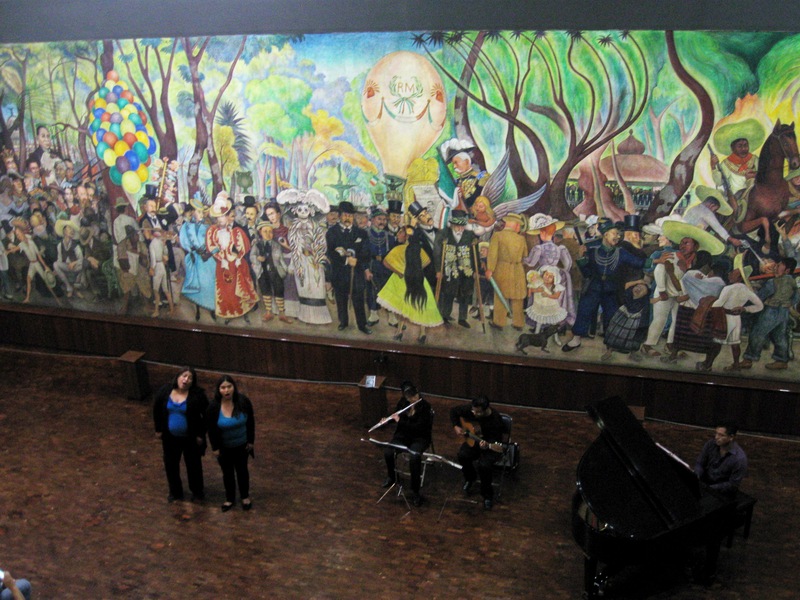 They stood in front of the painting and serenaded us with songs all in the beautiful and flowing language of Spanish. After two songs, we went up to the second floor rooms to view paintings by other famous Mexican muralists. As I wandered, I could still hear the music as the upper floor was almost a balcony over the main gallery room. The chords of a familiar song began, but I was certain it couldn’t really be Somewhere Over the Rainbow, but it was. I went to the balcony railing and looked down upon the two female vocalists standing in front of Rivera’s masterpiece. It was difficult to take a photo because of my tears. The women looked up at me as they sang. I threw them kisses at the end, and they bowed their heads slightly in my direction. It was the perfect ending to our Dream of a Sunday Afternoon in the Alameda Central. We planned to celebrate the end of my treatments for two awful viruses that invaded my body last year. Seven months of chemo-like treatments ended in early October, and the viruses were killed–along with my hair follicles. My husband was scheduled for a conference in Acapulco for mid-October so we decided to add some days to his travel itinerary and I would accompany him. He’d only been to Acapulco once before, and that was with my brother more than forty years ago. My brother died in 2008, and Robert thought it would be nice for me to go to the same places they went as young bucks out for a lark. It might have been one of the few times was my brother was truly happy. As soon as my treatments ended, I felt wonderful, even better than before. 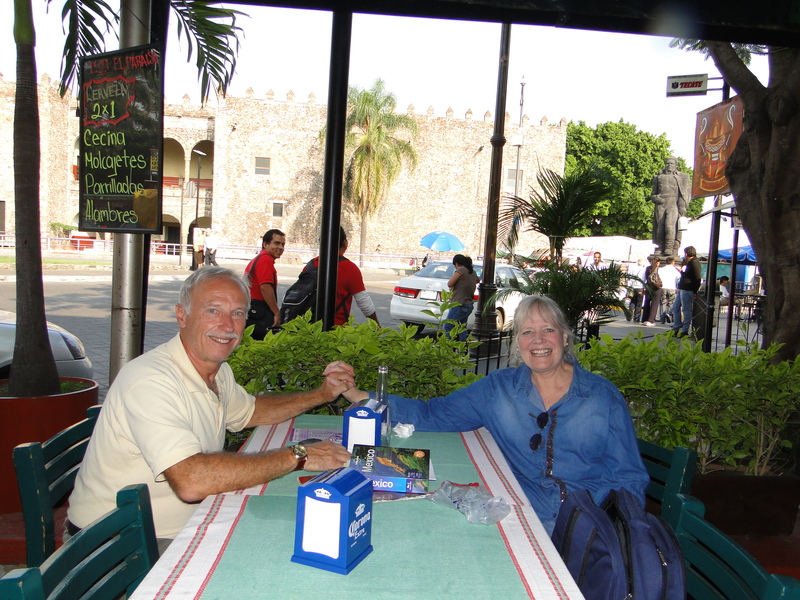 Robert had a cold when we started out, but he’s a healthy guy, and we both were certain with plenty of Vitamin C and lots of fluids, he’d be well by the time we started our journey, first to Mexico City, then by bus to Cuernavaca, and then by bus to Acapulco. 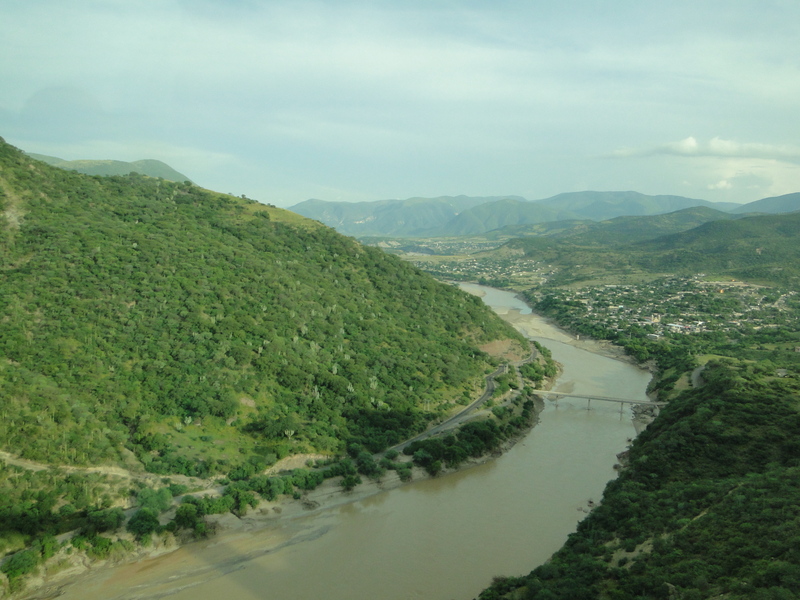 When we first planned the trip, we made reservations for a hotel in Pie de la Cuesta for one night. Pie de la Cuesta is only a few miles from Acapulco but a world away in beauty and pace. Robert and my brother stayed there for most of their month-long sojourn to Mexico. One month before we left, two major storms collided on the Pacific Coast and left Pie de la Cuesta in bad shape. We cancelled the hotel. 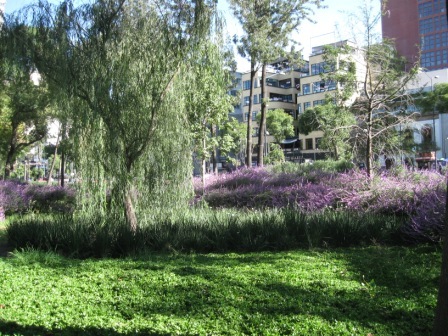 We spent our first day in Mexico City walking around the Zocalo and Alameda–the historic center of the city–with Robert sniffling and blowing his nose. 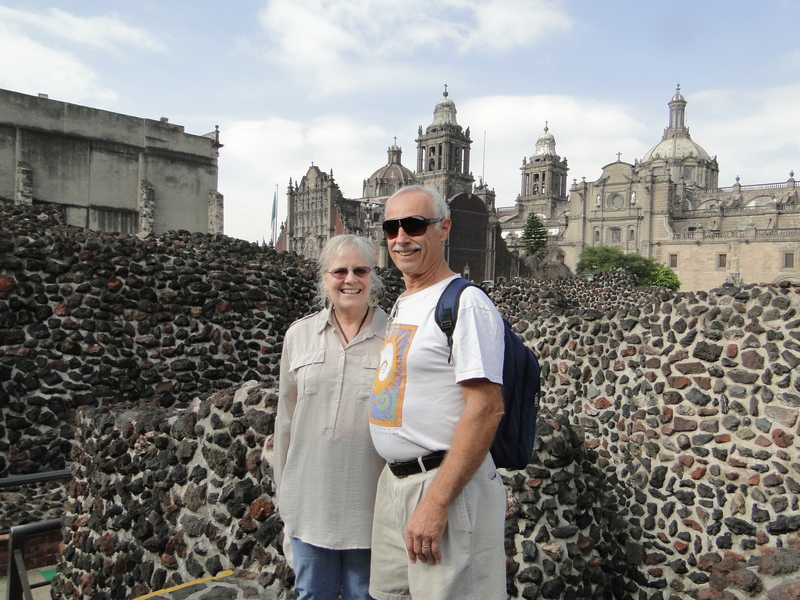 So we went with an overnight stay in one of the oldest cities in Mexico. Cuernavaca has been inhabited since 1200 BC. Our hotel had a beautiful pool overlooking green hills. The air pollution lifted even though we were only an hour from Mexico City. When we got out of the pool and started to walk up the stairs to the elevators, he couldn’t make it. My active and athletic husband had to stop after each step. We managed a few hours in the historic district, thanks to the concierge at the hotel who arranged for a taxi drop and pick up in a place near the two main plazas of town. By the time we made it to Acapulco, he was still in bad shape. He tried attending his conference for a few hours, but his coworkers sent him back to the hotel. We never made it to Pie de la Cuesta. We never saw the places where he’d been with my brother. But as I prepared to get him back to the States, I realized that you can’t really go back because nothing is the same as it was. The trip home was agony as we faced a six-hour bus trip, an overnight at airport hotel and then eight hours of plane trips home. Through the kindness of strangers, we managed with wheelchairs and escorts provided by Courtyard Mexico City Airport and Delta Airlines. Upon arrival in Pittsburgh, I drove him straight to the hospital where he was admitted with a severe case of acute bronchitis. They kept him in the hospital for four days. Now a few days later, I can hear him puttering around the house without coughing. I periodically poke my head out of my office to remind him to take it easy even though he’s feeling a bit better. “Life is what happens to you when you’re busy making other plans” reverberated through my head as we made our way home. We lived our life from moment to moment in Mexico with our roles reversed for the first time in a year. At one point, he looked up at me from a wheelchair and said, “You have no idea what it’s like not to be able to do things I could before.” I smiled, and he realized the irony in his statement. No one knew better than me what that was like. He gained instant empathy for what life must have been like for me when my body was attacking itself. And I learned what it was like to be the helpless, worried spouse. I wanted to cure him and make it all go away. I realized that’s exactly what he’d been saying to me over the past months. Despite our disrupted plans, we came full circle in our relationship. If we’d been able to go to the sites he wanted, we’d never have experienced this symbiotic reversal, which brought greater understanding of both our relationship and those around us. Here’s to health, which I never really appreciated until it disappeared for a time. Soon I’ll publish more on what we saw in Mexico. Synchronicity led me to write this post. “What other people think of me is none of my business.” I read this statement recently, and it stayed with me as the song heard on the radio in the morning that stays in my head throughout the day. In the past few months, I immersed myself in the journal of my great grandfather on my father’s side. I’ve wondered about this man whose life story I knew nothing about until I read his account of his days as a Union soldier in the Civil War. As I finished readying the journal for publication, two bloggers I follow (Staci Troilo and Lori Crane) began posting about their ancestors and heritage. All of these events made me think of another of my ancestors, whose story intrigues me. Emilene Stephens Hooper, my great grandmother on my mother’s side, was born 100 years before me in 1854 somewhere in southern England, most likely Cornwall. Twenty-two years later, she gave birth to my grandfather, Edwin Stephens. A few years before that, she gave birth to another son, Harry Stephens. That’s right—she gave birth to two sons whose surnames were the same as her maiden name. But here’s where it gets rather fascinating rather than mundane. In the census from 1880, she is listed as the owner of an inn in Cornwall. The two sons are listed, and it’s stated she was pregnant. A roomer at the inn was a Frederick Hooper. By 1881, she was married to Mr. Hooper and gave birth to a daughter named Katie Hooper. After her marriage to Fred, she gave birth to nine more children, all with the last names of Hooper. My grandfather, Edwin, left school early to work in the China clay mines of Cornwall. He also became a minister–all before the age of twenty. In 1900, he left England forever and came to the United States where he worked in the copper mines of Michigan’s Upper Peninsula. Several of his half siblings followed him to the States, and I remember Aunt Katie and her minister husband Uncle Simon. I remember Uncle Charlie Hooper and Aunt Lillian Hooper. My mother and her sisters kept in contact with these relatives, both those in the States and in England. None of us questioned why they didn’t carry the name of Stephens. My Aunt Nellie, the matriarch of the Stephens side of the family, took an interest in genealogy after her retirement as the school librarian and choir director. When she started the search, she realized something was amiss, and like the good stoic she was, she put away all the papers and told the rest of the family there wasn’t much to research. Aunt Nellie didn’t want anyone to discover that her father, the beloved Reverend Edwin Stephens had been born to an unmarried woman. 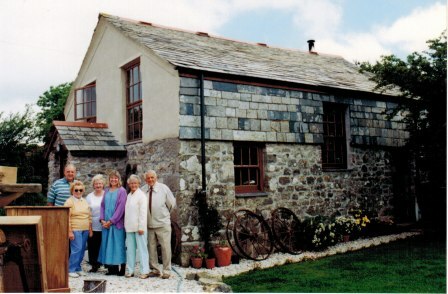 I went to Cornwall fifteen years ago and met my English cousins. The cousins who only remember Emilene in her older years told me stories of her famous hats she wore to church every Sunday. Not only was she respected, but she was a fashionista as well. Here’s one humanizing story told by one of her grandchildren. In her final years, she would often pass gas at inopportune moments. The grandchildren remember when it happened in church. Their grandmother Emilene would turn around to the children and give them a scowl so everyone in the nearby pews would assume one of the Hooper brood made the offensive sound during the Sunday sermon. I giggle to think of this woman in her wide-brimmed hat all prim and proper letting loose with a big one, yet blaming it on her poor grandchildren. So who was the father of my grandfather? We’ll never know. A cousin near my age in Cornwall did some research but found that all the birth records in the area where it was suspected Emilene was born had been destroyed by fire. All he found was the census of 1880 and her record of death in 1933. One of the cousins here in the States found the obituary of our grandfather where it lists a Joseph Varcoe as his father. That could have been invented for the sake of propriety as my grandfather died while a minister in a small Michigan town. The older English cousins told me that Emilene would never say where she came from and she had no contact with her parents. She told one of her children that her father was a very mean and cruel man. Emilene could have been sent to a large farm to work in the household. That would not have been unusual during that time for poorer farmers to send away their young daughters to work for wealthy landowners. She could have become the mistress of a landowner and perhaps his name was Joseph Varcoe. Then there’s another theory—one that is unsavory to consider. My English cousins told me their parents (children of Emilene) could never get their mother to tell them where she came from or who her parents were. This woman, my great grandmother, defied the societal rule of Victorian England and raised twelve children. She lived her life in her own way, and obviously not caring a whit what others thought. I tip my wide-brimmed hat in your direction, Emilene Stephens Hooper, and say thank you for teaching me lessons long after your death. Today’s post is inspired by my fellow blogger and author, Lori Crane, over at A Day in the Life of Patootie. She’s challenged all bloggers to participate in a month-long series of posts about our ancestors. Check out her blog – she’s loaded with anecdotes from her lineage. In the past few weeks, I’ve immersed myself in the writings of my great grandfather. He left behind a legacy for his children chronicling his years as a Union soldier in the Civil War. He joined Michigan’s 2nd Regiment in 1861 in the early days of the war. I’m putting the journal in electronic form so others can read about his experiences as a soldier and as a prisoner of war with the Confederates in the last year of the war. As I proofread a chapter, I came across this passage that gave me pause. The passage was written in December 1862 as the soldiers prepared to make winter quarters after several Union defeats. He wrote this in the days following the Battle of Fredericksburg, December 11-15,1862, where the Confederates won the battle, but nearly 18,000 men were injured or killed. If we’re discontent with what’s happening or not happening in Washington today, imagine what it was like to be a soldier in the field having seen the death and destruction of the bloody Civil War while the folks at home sitting in front of warm fires fought over petty matters. “December 1862 – With the whole surface of the country one vast mortar bed, active operations were not thought of in the army. Yet every newspaper that reached us was full of condemnations for the idleness of the troops in the field. Any attempt to move large bodies of men was inexpedient and to move artillery and supply trains was next to impossible. Isn’t it time we learned? Since moving from Florida to Pennsylvania, I’ve come to have a new admiration for the fall season. 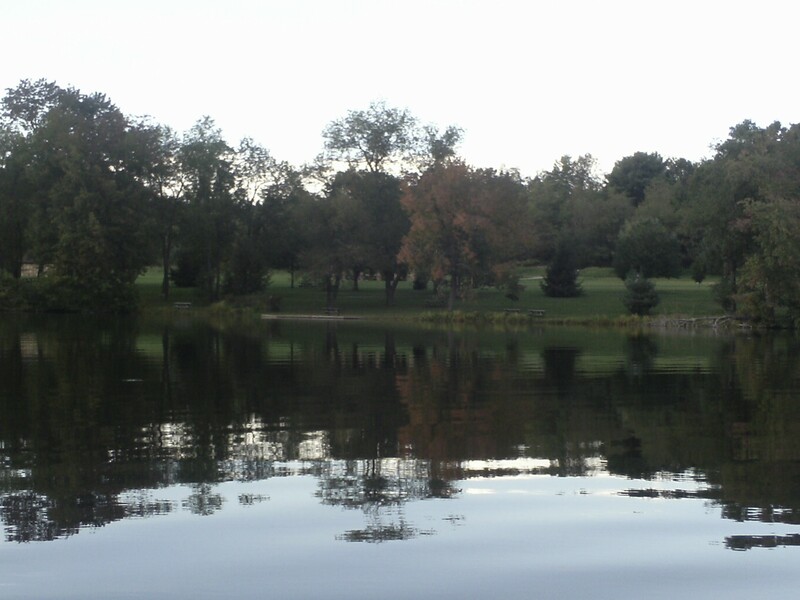 Our colors started turning slightly this past week, and the weather is nearly perfect. 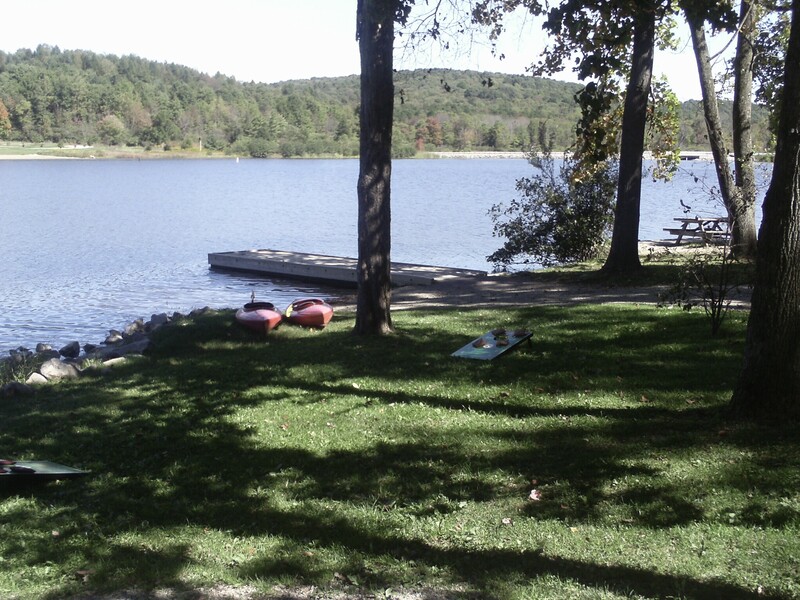 We took a few days off and went to Keystone Lake where we rented a cabin on the shores of the lake. The colors on the trees are no where near peaking, but the hint of oranges, reds, and yellows gave me enough of a preview to be in the mood for campfires and s’mores. 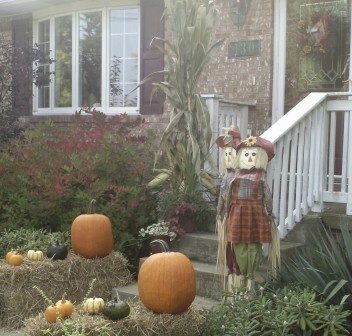 When we came home, I was ready to start the fall season. We went to our local farm, Janoskis, for pumpkins, bales of straw, corn stalks, and apples. I bought their own homegrown Ida red apples and made apple crisp a la Patricia la Zicka. I wanted to make a dessert that wasn’t overly packed with processed white sugar so I read through all the recipes and made up my own. When I pulled it out of the oven, I could tell immediately the texture was perfect – a crispy crust with a gooey sauce enveloping the apples. On first bite, I thought the taste of the apples – tart and sweet – was perfect. I wondered why it didn’t taste exactly like the usual apple crisps and pies. Then I remembered what I’d forgotten to add to my memory recipe book. I was so determined to make a healthy dessert, I forgot to add the essence to all foods. I forgot the spices. The crisp is still good, but I’m guessing that’s because the apples I used are fresh and local. 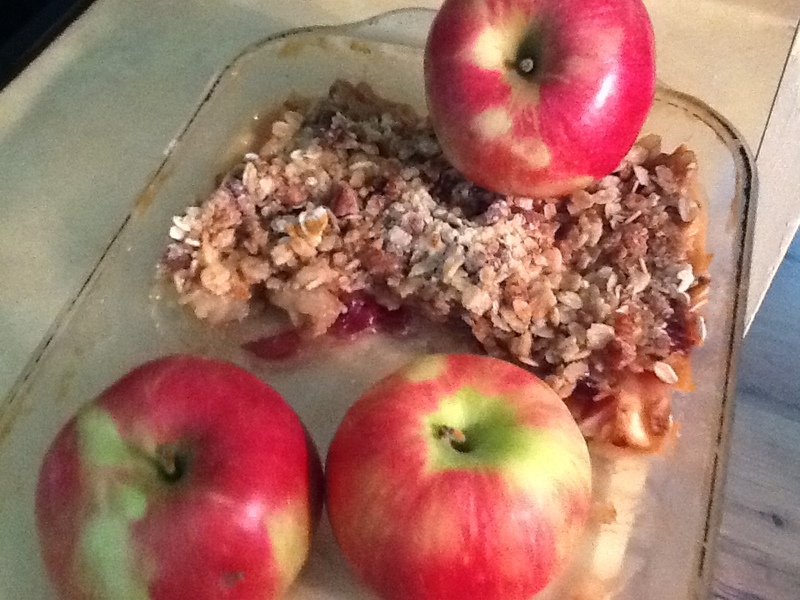 So here’s my recipe for a more healthy apple crisp, with the addition of a few spices. Put sliced apples into a bowl and mix with spices. Mix together the liquids and pour over apples. Place apples in a greased 9×13 pan. Mix together the dried ingredients and spread on top of the apples. Put butter pieces all over the top. Bake in a 350 degree oven for 45-50 minutes or until the top is crispy and the apples are bubbling. Allow to rest for a few minutes before digging into a delicious treat.